Would You Brush Your Teeth With FDA-Labeled Poison? When a Colorado Springs dentist noticed brown spots on the teeth of local residents in 1901, an almost fifty-year investigation ensued. The result was that fluoride in the water was causing teeth to develop a condition known as fluorosis. However, it ended not in the eradication of fluoride from water but from the recommendation that low levels of fluoride be added to public water supplies due to the strengthening effect it had on teeth. Today, nearly 95% of toothpaste on the market is chalk full of fluoride as a main ingredient. Over 200,000 Americans participate in the water fluoridation project and 13 million school children now take part in a school-based fluoride mouth rinse program. But what exactly is fluoride and what does it do? Fluoride is a by-product of manufacturing iron, aluminum and copper. Although classified as a pollutant, fluoride has been the cornerstone of dentistry for years on the basis that it prevents dental caries. However, when 39,000 school children around the United States were studied in the 1980’s, it was discovered that there was no real difference between the decay rates of children who consumed fluoridated water and those who did not. When World Health Organization statistics are studied it appears as though tooth decay is on the decline in up to fifteen countries including the Untied States; however the United States is the only one that adds fluoride to their water. Researchers believe that the decline in tooth decay is due to better oral hygiene, education and improved dental practices not fluoridation. In 1997, the FDA ordered that toothpaste manufacturers put a poison warning on all fluoride toothpaste sold in the United States. This was primarily aimed at parents to take note, as children tend to ingest a considerable amount of fluoride when they brush their teeth. Toothpaste generally contains about 1mg of fluoride per each gram of paste. The warming on toothpaste containers states that no more than a “pea-sized” amount of toothpaste should be swallowed, although manufacturers push all sorts of fun and flavorful toothpastes such as bubble gum and fruit and candy flavors. What child is not going to be tempted to swallow this stuff? In addition, children have a very poorly developed swallow reflex, which makes it easy to swallow large amounts of toothpaste in one brushing. Too much fluoride can cause dental fluorosis, a condition whereby excessive fluoride during the tooth-forming ages of 0-8 years presents as white spots or splotches on teeth to severe cases where there is black or brown staining as was seen in Colorado. Children who ingest too much fluoride may experience symptoms such as gastric pain, dizziness, flu-like symptoms, vomiting and headaches. These symptoms may occur with ingestion of only 01.mg to 0.3 mg per kg of bodyweight. Other problems noted with fluoride include skin rashes around the mouth and canker sores. A study out of the University Indiana reported that rats who received extremely small levels of fluoride developed high levels of blood glucose and decreased levels of insulin. 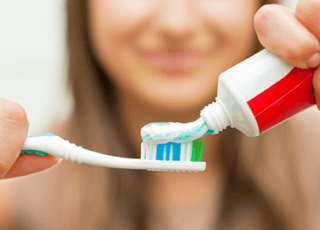 These findings raise questions as to whether or not the ingestion of fluoride toothpaste is a contributing factor to the increase of diabetes in children. Researchers urge diabetic children to use low-fluoride toothpaste. For those who want to make a change, there are several good fluoride-free toothpaste options to choose from. Well known brands such at Tom’s of Maine, Jason Healthy Mouth, Nature’s Gate Whitening Gel, Theodent and Desert Essence Natural Tea Tree Oil Toothpaste are just a few of the popular choices. Orajel makes a kid-friendly toothpaste that tastes fantastic and is fluoride-free. You can also try making your own toothpaste with baking soda, coconut oil and peppermint essential oil. Water fluoridation is banned in a number of countries including Sweden, Denmark, Germany, Finland, Hungary, Japan and Norway. Almost all of Europe’s water supply is free of fluoride. But in America we put fluoride in our water but also in juice, wine, coffee, soups, soda, processed food and even in bay formula. Most cities in America have fluoridated water. Although you may not die from drinking a glass of fluoridated water, the long-term impact of ingesting this substance, noted by some as being just a little less toxic than arsenic, raises much concern. Chronic conditions such as thyroid suppression, kidney failure, hives, birth defects and enzyme damage are some of the concerns that research has surfaced. It is wise that we learn all we can about fluoride, and it effects on health at this time so that we can make educated decisions. Hey Buddy!, I found this information for you: "Would You Brush Your Teeth With FDA-Labeled Poison?". Here is the website link: https://www.thealternativedaily.com/would-you-brush-your-teeth-with-fda-labeled-poison/. Thank you.